Our Company | Bre - Ex Construction Inc.
Over the past 50 years Bre-Ex Construction has been operating throughout Southern Ontario. In 1964, Bre-Ex was founded by Gerry Brekelmans and Bre-Ex continues to be family owned and operated to this day. Built on the foundation of a strong work ethic and business integrity, Bre-Ex continues to be a premier contractor based in the London area. Our industry leading experience, product expertise, customer service and workmanship are evident in our corporate structure and overall performance. Bre-Ex Construction has become an integral part of the London and area construction community. Bre-Ex is a major participant in the construction of water supply, sewage, and storm water infrastructure throughout Southern Ontario. 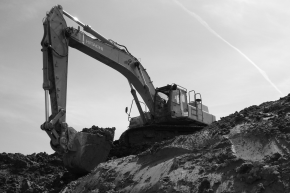 With a work force that is signatory to the Operators Local 793 and Labourers Local 1059, we have been able to evolve from excavating house basements to now completing integral parts of water/sewage treatment plants and major arterial roadways in and around Southern Ontario. With an experienced and skilled workforce, we are confident to continue to enter into and complete construction projects that require a great deal of adaptability, innovation, and creativity. Our mission is to provide diverse, leading edge solutions to our clients while maintaining a safe and positive work environment for our employees. We will not compromise on providing our customers with the very best installers, Project Managers, Field Superintendents, Estimating and Technical Support for their projects.